Protect your networks from the most brutal environments with Ubiquiti’s TOUGHCable PRO, industrial-grade shielded Cat5 Ethernet cable with an integrated ESD drain wire. TOUGHCable™ dramatically increases your Ethernet link states, speeds and overall performance. TOUGHCable™ has been built to perform in even the harshest weather and environments. 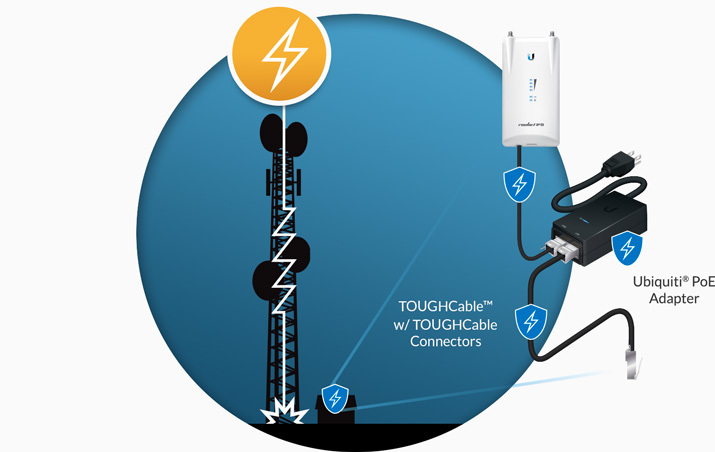 TOUGHCable™ protects your networks from devastating electrostatic discharge attacks. • Dramatically improves your Ethernet link states, speeds, and overall performance. • Built to perform even in the harshest weather and environments. • Protects your networks from devastating electrostatic discharge (ESD) attacks. • Developed to increase power handling performance for extended cable run lengths.